Trump says it's 'unfair' that Attorney General Jeff Sessions recused himself. Twitter disagrees. In a surprisingly candid interview with the New York Times, President Donald Trump shared his thoughts on the pending investigation into collusion with Russia — which Trump claims may not even exist. 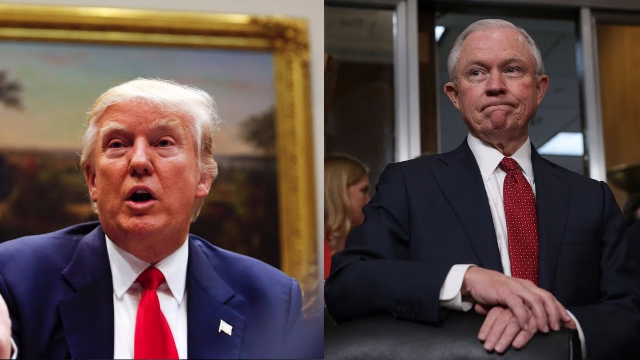 "[Attorney General Jeff] Sessions should have never recused himself, and if he was going to recuse himself, he should have told me before he took the job and I would have picked somebody else," said Trump. He elaborates that Sessions didn't give him a heads up that he had decided to recuse himself from the investigation. The decision was "very unfair to the president," he continued. "It's extremely unfair — and that's a mild word," Trump said. Twitter, however, disagrees. Hard to see how AG Sessions continues after POTUS calls his recusal on #Russia "extremely unfair, and that’s a mild word, to the president"
Why would Trump care whether Sessions recused himself or not unless he wanted him to quash the investigation? Unbelievable thing to admit. "At one point, his daughter, Ivanka, arrived at the doorway with her daughter Arabella, who ran to her grandfather and gave him a kiss. He greeted the six-year-old girl as 'baby,' then urged her to show the reporters her ability to speak Chinese. She obliged." At least if Trump goes down, there will be someone in the White House who can try to handle diplomatic relations.